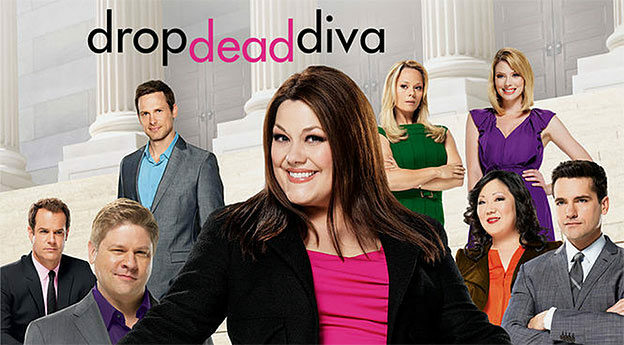 Drop Dead Diva Season 1 Review: This show has blown my mind in such a positive way. So, here’s the gist of the premise: Deb Dobkins is a thin and conventionally attractive model who dies in a car crash on her way to audition to be a prize model on the Price is Right; Jane Bingum is a fat lawyer who is shot in her office by someone intending to kill her boss. Due to a kerfuffle at the gates of Heaven, Deb’s soul is returned to Earth, but…wait for it… in the body of Jane Bingum. This is so hah-hah funny because Deb is a model and Jane, being fat, is probably the worst thing that could happen to her (sigh). Let’s get over sad this set up is, shall we? I have to say this show does not shy away from tackling the complex issues related to being a fat woman in America. Instead of focusing on Shallow-Hal-like depictions of fatness that are one-dimensional, offensive and unproductive, Drop Dead Diva tackles things like sizeism, the pitfalls and dangers of dieting, the absurdity of clothing stores like A&F and the popular conflation of thin and healthy. While Jane seems to work for a corporate defense, she takes on cases defending the underdog as well as suing on behalf of the underdog (I don’t think this is a realistic depiction of law firms, but let’s run with it). This entry was posted in reviews and tagged dieting, drop dead diva, movie review on March 14, 2017 by kevin.